Even if the U.S. government abandons its insistence on a backdoored iPhone, Beijing may not. Certainly, China watches U.S.statements and policy very closely. An early draft of China’s counterterrorism law included provisions requiring the installation of backdoors and the reporting of encryption keys. In the face of criticism from the US government and foreign technology companies, Fu Ying, spokeswoman for the National People’s Congress, defended the provisions as in accordance with “international common practices,” adding that it was common for the Western countries, such as the United States and Britain, to request tech firms to disclose encryption methods. The final law, passed in December 2015, was much more ambiguous about what type of demands the government would make on technology companies, but it is clear that Chinese leaders are more than happy to exploit what is happening in the United States as rhetorical cover. Yet we should be clear that what happens in the United States will have very little impact on what China ultimately decides to do. Beijing, like governments everywhere, wants to collect and analyze data for law enforcement and national intelligence reasons. The desire for data may only intensify under Xi Jinping’s leadership; the Chinese Communist Party appears increasingly worried about domestic stability and the spread of information within the country’s borders. For foreign companies, refusal to cooperate with the Chinese authorities will increasingly lead to a loss of market opportunities. Faced with competing pressures across the many jurisdictions that they operate in, there are no easy options for the companies. Any resolution will be political, not technical. The ideal outcome is a multilateral agreement that embraces privacy and the strongest encryption possible, but also allows government access to data for legitimate purposes. At least 15 people were killed and another 31 were wounded when a suicide bomber detonated an explosive vest in a pedestrian area between the Ministries of Finance and Defense in the Pul-e-Mahmood Khan area of national capital Kabul on February 27, 2016. Most of the victims were civilians (though the numbers are yet unspecified), in an attack that apparently targeted Government employees. Earlier the same day, a suicide bomber killed at least 13 persons, including an anti-Taliban local militia commander identified as Malik Khan Jan, outside the Governor's compound in Asadabad, the provincial capital of Kunar. Provincial Governor Wahidullah Kalimzai said, "Most of the victims were civilians and children who were either passing by or playing in the park." At least 40 people were injured in the attack. On February 21, 2016, at least 14 people, including nine civilians, were killed and another 19, including 17 civilians, were injured in a suicide bombing in a crowded market in the Sia Gerd District of Parwan Province. According to partial data compiled by the South Asia Terrorism Portal (SATP) at least 140 civilians have already been killed in Afghanistan since the beginning of the current year (data till March 4, 2016). The United Nations Assistance Mission in Afghanistan (UNAMA) which began systematically documenting civilian casualties on January 1, 2009, has recorded 58,736 civilian casualties (21,323 dead and 37,413 injured) up to December 31, 2015. Through 2015, UNAMA recorded 11,002 civilian casualties (3,545 civilians dead and 7,457 injured) as against 10,534 (3,701 civilians dead and 6,833 injured) in 2014. More disturbingly, women and children constitute a rising proportion of the victims of this violence. While overall civilian casualties increased by four per cent in 2015 in comparison to the previous year, casualties among women increased by 37 per cent (1,246 women casualties, including 333 dead and 913 injured) and by 14 per cent among children (2,829, including 733 dead and 2,096 injured). U.S. Vice President Joe Biden arrived in Israel on March 8 in the wake of another meaningless crisis in U.S.-Israeli relations. Diplomatic circles are agog with the fact that Israeli Prime Minister Benjamin Netanyahu not only declined an invitation to visit Washington, but leaked his decision to the press before formally informing the White House. To the cognoscenti of U.S.-Israeli relations, this flows from the deep mutual dislike between Netanyahu and President Barack Obama. And from their point of view, that dislike is driving U.S.-Israeli relations. It is possible that the two leaders dislike each other. The leak may have been a deliberate insult by Netanyahu or just a typical leak, which is as common in Israel as it is in the U.S. But whichever it is, it is not driving U.S.-Israeli relations, and a new president and a new prime minister would be experiencing the same tensions even if they loved each other. The tension is not personal. It comes from fundamental shifts in U.S. and Israeli interests. It must be remembered that the United States and Israel were not close prior to the 1967 war. France provided most of Israel's weapons, and the U.S. hardly provided any. It was after the 1967 war and France's break with Israel that the U.S. became Israel's major benefactor. And the flow of arms and aid only became substantial after the 1973 war between Israel, Syria and Egypt. I point this out to make clear that the intimate relationship between Israel and the United States did not exist for the first quarter-century of Israel's history. The relationship is not a given, and it should not be surprising that it is fraying. There were two parts to the relationship. Israel had security requirements that outstripped its financial and industrial capability. It could defend itself only if it had a great power underwriting its national security. In order to entice such a power, Israel had to be prepared to be useful to the great power, but also prepared to trim its foreign policy to fit within the framework of the great power's interests. France saw value in Israel until 1967 and then broke with it because the war was not in France's interest. Israeli foreign policy was then built around being of value to and aligning with the United States. The American interest in Israel as a strategic asset doesn't arise until a major shift in the Cold War. In the mid-1960s, there were pro-Soviet coups in Syria and Iraq. Turkey, the critical American ally in the region, was being pressed from the north by the Soviets. If pressure arose from the south as well, Turkey might buckle. Iran served to tie down the Iraqis. Israel tied down the Syrians and, as a bonus, served as a strategic threat to pro-Soviet Egypt. Under these circumstances, aid to Israel was an investment in U.S. national security. Israel threatened Soviet assets in a cost effective way and, along with the Shah's Iran, was a foundation of U.S. strategy in the region. Turns out, "Minority Report" should have been set in Beijing. What if the Communist Party could have predicted Tiananmen Square? The Chinese government is deploying a new tool to keep the population from uprising. Beijing is building software to predict instability before it arises, based on volumes of data mined from Chinese citizens about their jobs, pastimes, and habits. It’s the latest advancement of what goes by the name “predictive policing,” where data is used to deploy law enforcement or even military units to places where crime (or, say, an anti-government political protest) is likely to occur. Don’t cringe: Predictive policing was born in the United States. But China is poised to emerge as a leader in the field. First, some background. What is predictive policing? Back in 1994, New York City Police Commissioner William Bratton led a pioneering and deeply controversial effort to pre-deploy police units to places where crime was expected to occur on the basis of crime statistics. Bratton, working with Jack Maple, deputy police commissioner, showed that the so-called CompStat decreased crime by 37 percent in just three years. But it also fueled anunconstitutional practice called “stop-and-frisk,” wherein minority youth in the wrong place at the wrong time were frequently targeted and harassed by the police. Lesson: you can deploy police to hotspots before crime occurs but you can cause more problems than you solve. That was in New York. Wu Manqing, a representative from China Electronics Technology, the company that the Chinese government hired to design the predictive policing software, described the newest version as “a unified information environment,” Bloombergreported last week. Its applications go well beyond simply sending police to a specific corner. Because Chinese authorities face far fewer privacy limits on the sorts of information that they can gather on citizens, they can target police forces much more precisely. They might be able to target an individual who suddenly received and deposited a large payment to their bank account, or who reads pro-democracy news sites, or who is displaying a change in buying habits — purchasing more expensive luxury items, for instance. The Chinese government’s control over the Internet in that country puts it in a unique position to extend the reach of surveillance and data collection into the lives of citizens. Chinese authorities plan to deploy the system in places where the relations between ethnic minorities and Chinese party are particularly strained, according to Bloomberg. Recent developments have dispelled the myth that China’s rise will be peaceful. China’s land grab and subsequent militarization of “islands” in the South China Sea have finally dispelled the myth that its rise will be peaceful. Indeed, these developments point to an unwelcome fact – that China has become a predator state. Rand’s Michael Mazarr wrote about predator states in the late 1990s. He argues that what distinguishes a predator state above all is “territorial aggression” – the predisposition to grab territory and resources. China is one of two contemporary examples; the other is Russia in Europe. The best historical examples are Napoleonic France, Nazi Germany and Imperial Japan, and more recently Iraq under Saddam Hussein. These examples teach us that predator states cause wars. Besides territorial aggression, predator states exhibit several other distinguishing features. First, national policy demonstrates very high levels of militarization. Predator states divert large quantities of national resources into military expansion for purposes of power projection. The emphasis in military planning and weapons acquisitions is inherently offensive rather than defensive and is geared to intimidating potential adversaries and winning offensive wars. The flipside domestically is, as Mazarr writes, that “military, nationalistic, and territorial issues continue to play a large role in domestic politics and in the states’ approach to the world.” In China’s case, nationalism has overtaken Marxism and more recently developmentalism as state ideology. China is bound to fail in at least one of its three conflicting aims to achieve growth, institute reform and maintain stability, says Moody’s as it engages in a war of words with Beijing over the country’s economic prospects. China’s three policy objectives formed an “impossible trinity”, the ratings agency said in a research report published on Tuesday. Beijing could at best achieve only two of those objectives at one time, it said. The research note – authored by six analysts and led by Michael Taylor, Moody’s managing director and chief credit officer for the Asia-Pacific – was released just hours after China reported a 20 per cent drop in February exports – its biggest fall since 2009 when the country was hit hard by the global financial crisis. China on Tuesday reported a 20 per cent drop in February exports – its biggest fall since the global financial crisis in 2009. Photo: EPAIn the face of its “trilemma”, Moody’s said, China was now pursuing growth and stability over reform, as seen from its government work report delivered to the National People’s Congress. “While the combination of growth and stability might seem to minimise risks in the short run, it is likely to leave unaddressed, in the long run, the deep imbalances evident in China’s economy, thereby increasing the long-term adjustment costs,” the report said. Moody’s angered Beijing last week when it changed the country’s credit rating outlook from stable to negative even as the Chinese government tries desperately to convince the world that its economy remains safe and stable. A few months ago, in a remote town in Idlib province, northern Syria, an unusual foreign militant presence alarmed Syrian locals. 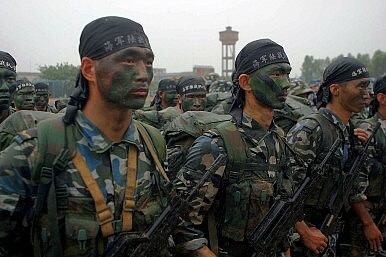 The fighters were reportedly of the Muslim Uighur minority from Xinjiang province in Western China. For a population which has grown used to the multinational nature of the militancy, two aspects of these new fighters struck them: their large numbers and their ethnicity. A year ago, they were barely hundreds of Uighur fighters, belonging to the Al-Nusra Front-allied Turkistan Islamic Party (TIP). Today, according to several sources in the province, there are a few thousand Uighur fighters, and many of them arrived with their families after a long and treacherous journey from China and central Asia. The Uighur are believed to have been seen in large numbers in disparate regions of Idlib, including the strategic town of Jisr al-Shoghur, Ariha, and the highlands of Jabal al-Zawiya. They have settled with their families in deserted Alawite towns in Jisr al-Shoghur, a local journalist told Al Arabiya English.Videos have emerged since last October purporting to show them fighting in al-Ghab plains in Hama’s western countryside. And in Jib Al-Ahmar in Latakia Province, the propaganda material showcases a tank and U.S. made anti-armor Tow missiles. The Uighur militants had reportedly moved into Syria following a Chinese-backed Pakistani campaign against their bases on the borders with Afghanistan. The Pakistani military claimed they had assassinated the group’s leader, Abdul Haq, in 2010. The Pakistani Defense minister went further during a visit to China last year, to declare the al-Qaeda linked group members have either been killed, or have left Afghanistan somehow. The Uighur’s increasing presence is believed to be behind the string of reports about possible Chinese intervention alongside the Russian and Syrian regime forces. Chechen militants in Syria have been going through organizational changes since last summer. The position of the Chechen militants in the Middle East was especially damaged by a conflict within the Jaish al-Muhajireen wal-Ansar group and the difficult situation inside the Junud al-Sham group. Those militant organizations have been led, respectively, by Salahudin Shishani (Paizulla Margoshvili) and Muslim Shishani (Murad Margoshvili). Both men are ethnic Chechens from Georgia’s Pankisi Gorge. In the summer of 2015, Amir Salahudin left Jaish al-Muhajireen wal-Ansar, one of the best known groups comprised of citizens of countries of the former Soviet Union (Infochechen.com, June 6, 2015), and formed another group, Jaish al-Usrah. The new group again tried to recruit members from the Caucasus. The former Jaish al-Muhajireen wal-Ansar brigade, which no longer had Chechens or Amir Salahudin, allied itself with the al-Nusra Front and lost the high status it had enjoyed in Syria when it was led by Chechen commanders (Justpaste.it, June 2015). Jaish al-Muhajireen wal-Ansar once had 1,500 to 2,000 militants, while Amir Salahudin’s current group has only of about 200 members—those militants who decided to stay with him to the end. Many of Jaish al-Muhajireen wal-Ansar’s militants left the group after Amir Salahudin was removed as its commander and joined the so-called Islamic State. The rest of the group became an al-Nusra Front affiliate, which Salahudin had not agreed with (Kavkazsky Uzel, October 3, 2015). Amir Salahudin still wears the Caucasus Emirate’s logo on his clothes, which means he remains faithful to the organization. He still considers himself to be the Caucasus Emirate’s representative in Syria. Even though the Caucasus Emirate has been significantly transformed in the North Caucasus, Amir Salahudin can claim partial credit for the fact that it still exists. Salahudin’s group in Syria is bigger than all the militants in the underground movement of the North Caucasus put together. The Iraqi Army defenders of Ramadi had held their dusty, stony ground for over a year and become familiar with the increasing adeptness of their opponents waving black flags. At first, these Iraqi Army units simply faced sprayed rifle fire, but then it was well-placed sniper rounds that forced these weary units to keep under cover whenever possible or risk a death that only their comrades — but never the victim — would hear. Tired, beleaguered, and cut off from reinforcements from Baghdad, they nonetheless continued to repulse attack after attack. The last months witnessed a new weapon — car bombs. The Islamic State in Iraq and the Levant (ISIL) and its predecessor, al-Qaeda in Iraq, had long been the masters of using car bombs, but almost always against isolated checkpoints or undefended civilians. But an old tactic found a new situation. Car bombs, now parked against outer walls and driven by suicide bombers, were thrown against the Iraqi Army’s defenses in Ramadi. The defenders were professional soldiers, and the last decade of war had taught them a great deal about the use of concrete barriers to defend against explosives of all kinds. So while the car bombs created a great deal of sound and fury, they availed little. Then one bright day in May 2015, the defenders awoke to a new sound. Crawling forward slowly toward the heavily barricaded road was a bulldozer followed by several large cargo and dump trucks. The soldiers began to fire as the bulldozer entered the range of their machine guns and rifles, but it was armored by overlapping welded steel plates. The bullets bounced off the advancing earthmover. The defenders lacked one key weapon system — an anti-tank missile that could penetrate the armor of the tracked vehicle. So while the soldiers kept up a steady volume of fire, they were helpless as the dozer began to remove the concrete barriers that blocked the road between their positions and the row of large armored trucks. One layer of concrete was removed after another until the road was clear. And so the trucks begin to pour through. While creating vehicle-borne bombs is an ISIL specialty, the technology is actually remarkably simple, as each truck carried in its five-ton bed the same basic formula used two decades ago by Timothy McVeigh at Oklahoma City — ammonium nitrate fertilizer soaked in gasoline. As each truck closed on the defenses, its suicide bomber detonated the payload, shocking beyond reason those who were not killed outright. As truck after truck delivered its lethal payload, black-clad fighters poured from behind the trucks to exploit the newly created hole in the defenses. The survivors fell back and tried to maintain some semblance of order, but it was far too late to have any hope of saving this day. Ramadi had fallen. A rickety gate of galvanized wire is all that separates desperation from hope. The gate is part of the fence erected in the farming village of Idomeni on the border between Greece and Macedonia. At this moment, some 12,000 people are waiting for it to be opened. It's the gateway to Europe and the gateway to Germany.A woman in boots and a blue uniform stands guard in front of the gate. Her name is Foteini Gagaridou and she is an official with the Greek border police -- and she looks exhausted. All it would take for her to open the border would be to pull a thin metal pin out of the latch, but she's not allowed to. If it were up to her, she says, she would let every single one of these people pass through, just as they were able to do just a few weeks earlier -- across the border to Macedonia and on through Serbia, Croatia and Slovenia to Austria, where they could continue their journey to Germany on what is known as the Balkan Route. It's the same path chosen by hundreds of thousands of refugees last year, but the Balkan Route is now closed. It ends at Gagaridou's wire gate. This is where Fortress Europe begins, secured with razor wire and defended with tear gas. Desperate scenes played out here on Monday, reminiscent of those witnessed in Hungary back in September. A group of young men used a steel beam as a battering ram to break down the gate. Rocks flew through the air as the gate flew off its hinges, prompting the volleying of tear gas cartridges and stun grenades from the Macedonian side. Men could be seen running and children screaming. One woman lay on the ground with her daughter, crying. This frontier has become Europe's new southern border, with Greece serving as Europe's waiting room -- and the possible setting for a humanitarian disaster. Around 32,000 migrants are currently stranded in the country, a number that the Greek Interior Ministry says could quickly swell to 70,000. The aid organization Doctors Without Borders is even expecting 200,000 refugees. Greece's reception camps are already full, and the highly indebted country is stretched well beyond its capacity. Today, robots are increasingly handling many jobs in manufacturing that were done by human hands not more than 20 years ago. This sea change has affected a variety of industries, and it’s one reason why the jobs recovery of the past few years hasn’t included as many manufacturing jobs. Those jobs weren’t just destroyed — they were lost to smart machines. But while we’re living in a time when computer programs already dominate Wall Street, and when driverless cars and delivery drones are moving from science fiction to mundane fact, those developments may be just the tip of the iceberg. 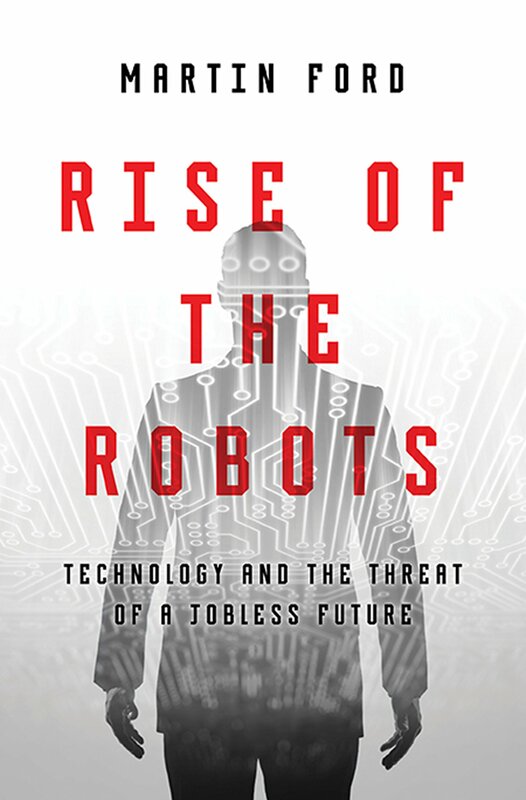 Martin Ford, author of Rise of the Robots: Technology and the Threat of a Jobless Future, recently appeared on the Knowledge@Wharton show on Wharton Business Radio on SiriusXM channel 111 to talk about how the robot revolution has affected businesses in a host of industries, what it means for jobs in the years ahead, and what other surprises might be on the horizon. A top director at UK spy agency, the Government Communications Headquarters (GCHQ) has admitted he was fighting a losing battle when it comes to cybersecurity – despite an £860m boost in government funding over the past five years. Alex Dewdney, director of cybersecurity at CESG which is the information security arm of GCHQ, was speaking during the recent RSA conference in San Francisco where he outlined some major problems encountered by cyber-experts tasked with protecting the UK from attack. "We can point to lots of achievements around understanding the threats much better, about taking steps to mitigate those threats, addressing the national skills base and so on but, nationally, we are not winning the fight on cyber security," Dewdney said. The UK government has invested a total of £860m on cybersecurity over the past five years as part of the Cyber Security Programme while pouring cash into projects like the Computer Emergency Response Team and the Cyber Information Sharing Partnership. Furthermore, to fight the growing threat from cybercriminals chancellor George Osborne recently confirmed that, in the next funding round, spending will rocket to more than £3.2bn. To highlight the scale of the problem now faced by GCHQ, Osborne claimed the agency was now actively monitoring "cyber threats from high-end adversaries" against 450 companies across the UK aerospace, defence, energy, water, finance, transport and telecoms sectors. By Damian Paletta , The Wall Street Journal , Jan. 21, 2016 WASHINGTON—The U.S. military has spent five years developing advanced cyberweapon and digital capabilities and is likely to deploy them more publicly soon, the head of the Pentagon’s U.S. Cyber Command said Thursday. Adm. Mike Rogers, who is also director of the National Security Agency, said U.S. policy makers have largely agreed on rules of engagement for when cyberweapons can be used for defense. There is still an open discussion, however, about when cyberweapons should be used for “offense,” such as carrying out attacks against a group or foreign country. Still, Adm. Rogers stopped short of specifying how exactly these cyberpowers could be deployed in coming months. Despite a series of high-profile cyberattacks in the past two years, including a large-scale breach at Sony Pictures Entertainment Inc. in late 2014 and the theft of millions of records from the U.S. Office of Personnel Management in 2015, Adm. Rogers suggested many Americans have become complacent, since they don’t see the rise of cyber armies and cybercriminals affecting their daily lives. That could change fast, he said, if a cyberattack achieves large-scale destruction, particularly in a fashion resembling a more traditional weapon. Analysts have said these sorts of acts could including attacking a country’s electrical grid or knocking a nation’s financial system offline. Last week, WhatsApp announced in a blog post that it will stop supporting a number of mobile operating systems starting in 2017. Among those platforms scrapped by WhatsApp are Nokia's mobile platforms, Windows Phone 7.1 and most notably BlackBerry. WhatsApp's plan to focus on fewer platforms is the latest of many signs pointing in the same direction: the mobile platform war is over and there are two big winners. Last year, Android and iOS devices accounted for 97.5 percent of global smartphone sales, up from just 38 percent in 2010. Every day, hour after hour, the world’s spies send top secret information you can easily listen in on. When I was 10 years old, I found a shortwave radio in a crumbling old leather trunk where we kept family photos and other memorabilia. As I spun the dial, tinny, modulating noises, like the song of an electronic slide whistle, emanated from the radio’s small speaker. Staticky cracks and pops competed for airtime. The sounds swished and swirled, unintelligible and unremarkable. But then, emerging through the clamor, was a voice. I might have run right over it with the dial, but the voice’s rhythmic, steady pacing caught me up short. It wasn’t a deejay. Nor a commercial. And he wasn’t singing. He was just speaking. The same line, over and over again. I don’t remember if those were the exact numbers. But they were numbers. A repeated sequence which had no obvious meaning, and was entirely devoid of context. To find him here, amidst the screeches and howls of the shortwave frequencies, was like coming upon a man standing in the middle of a forest, talking out loud to no one. How long had he been here? Who was he talking to? He had that officious tone of the recorded telephone operators who chastised you for dialing a wrong number. “Please hang up, check the number, and dial again.” And the same distracting static I’d heard in those messages filled the background. I wasn’t sure if he was speaking live, or if he’d been recorded and set loose to play into the air. But there was an urgency to his tone. And a purpose. As if he were talking to me. Imploring. Listen. Hear me now. 7…6…7…4…3. Did you get that? 7…6…7…4…3. I was simultaneously terrified and captivated. I never touched the radio again. My curiosity was suppressed by a feeling of dread that I had heard something not meant for me. But I never stopped thinking about it. The voice became a character I passed around with friends during late-night ghost stories. The Bell Witch. The Killer in the Back Seat. The Numbers Man. I understood that the voice wasn’t an apparition or an urban legend-which made it even more compelling. But it would be another 25 years before I learned what I’d really heard on the shortwave radio. That man had been talking to someone. Not me. But someone in particular, who knew exactly what the Numbers Man was saying. I had intercepted a message to a spy. What’s the Deal With Cyberwar? On Wednesday, March 9, New America’s Cybersecurity Initiative will host its annual Cybersecurity for a New America Conference in Washington, D.C. This year’s conference will focus on securing the future cyberspace. For more information and to RSVP, visit the New America website. So, what does cyberwar mean anyway? You haven’t really answered my question. That’s partly because it’s hard to provide a definitive answer. Experts tend to argue about the way that we use the term cyberwar. Some suggest that we should use it to discuss only acts of war that do real damage by purely digital means. In this sense, Cyber World War I would presumably be a war conducted entirely online, one in which there would be no opportunity for “boots on the ground.” Loss of life—if there were any—would presumably come about through attacks on the digital components of critical infrastructure rather than from bullets or bombs. Since many feel that we’re unlikely to ever find ourselves in such a situation, it might be more practical to speak of a cyberwar as a conflict in which the digital simply plays a central part. But if we take that approach, we might just be giving a new name to the way we already do things. The U.S. National Guard's cyber unit may join the fight against the Islamic State terrorist group in Iraq and Syria, Defense Secretary Ashton Carter said. "Units like this can also participate in offensive cyber operations of the kind that I have stressed we are conducting, and actually accelerating, in Iraq and Syria, to secure the prompt defeat of ISIL, which we need to do and will do," Carter said, using an acronym for the group. "We're looking for ways to accelerate that, and cyber is one of them," he added. Carter visited the National Guard Cyber Unit at its base Friday in the northwestern U.S. state of Washington. He noted the squadron was not currently engaging in offensive cybermissions. As part of that effort, Carter said he would not rule out cyber operations to work on an offensive strategy to try to disrupt the Internet outreach operations of the militant group. Since it was formed back in the late 1990s, the cyber unit has focused solely on defensive cybersecurity efforts, National Guard officials told the Seattle Times newspaper. The National Guard's cyber unit is a 101-person team of part-time soldiers, most of whom have full-time jobs in the tech industry at companies such as Microsoft and Google. “Using National Guard units for such work made sense because it allowed the military to benefit from private sector cyber experts,” Carter said. "It brings in the high-tech sector in a very direct way to the mission of protecting the country," he added, "And we're absolutely going to do more of it." The U.S. National Guard is a reserve military force, composed of military units of each state, the District of Columbia and the territories of Guam, the U.S. Virgin Islands, and Puerto Rico. 2/26/2016 - PETERSON AIR FORCE BASE, Colo. -- Air Force Space Command achieved a significant milestone Feb. 12 when the Cyberspace Vulnerability Assessment/Hunter Weapon System reached Full Operational Capability status. Achieving FOC means the CVA/H weapon system is fully capable to serve as the premier enclave defense platform for prioritized traffic in the Air Force Information Network. The CVA/H weapon system enables execution of vulnerability assessments, adversary threat detection and compliance evaluations. CVA/H is a tool for cyber defense, used inside the boundaries of the defended cyber system. The Air Force equips its Cyber Protection Teams with the CVA/H weapon system. "This achievement underscores our commitment to the U.S. Cyber Command Cyber Protection Team mission and to the defense of prioritized cyberspace terrain in the Air Force portion of the Department of Defense Information Network. CVA/H defends the Air Force's ability to fly, fight and win in air, space and cyberspace," said Brig. Gen.l Stephen Whiting, AFSPC Director of Integrated Air, Space, Cyberspace and ISR Operations, who signed the FOC declaration. The weapon system provides the ability to find, fix, track, target, engage and assess advanced persistent threats to AF missions on prioritized network enclaves within the AFIN. CVA/H operators focus on providing vulnerability assessment and the Hunter mission. The Hunter mission provides the 24th Air Force commander and supported combatant commanders with a deployable, precision capability to identify, pursue within network boundaries, and mitigate cyberspace threats impacting critical links and nodes in support of theater or functional operations. The CVA/H weapon system provides a cyberspace security capability offering in-depth assessment of information system assets such as computers, infrastructure, applications, data, and cyberspace operations. The CVA/H weapon system consists of four primary components: the Mobile Interceptor Platform, the Deployable Interceptor Platform, the Garrison Interceptor Platform, and the Information Operations Platform-Fly Away Kit. I’m not sure that the U.S. has a special risk associated with it. There are a couple of issues for the U.S. One is that the rules are not yet clearly defined – we are slowly rolling out rules for use of UAVs in this country. So there’s a lot of confusion from everyone from hobbyists to commercial entities that want to use these for everything from real estate to wedding photography to fighting fires – and the rules are slow in coming in this country. In other countries, the rules for UAVs are a little more advanced on the commercial side. But it also includes the rules about lethal use. Whether it is U.S. lethal use in foreign countries, whether it is rules about arms proliferation, there’s still a lot of clarity missing from our understanding about who can use the technology and under what circumstances. I think that is the issue: there is still a lack of clarity about rules, regulations, proliferation, etc. The Unmanned Aerial Vehicle (UAV) industry is growing rapidly, and this is causing some concern about individuals using UAVs for illicit purposes. The Cipher Brief spoke to Rachel Stohl, of the Stimson Center, about these concerns and the overall development of both UAV and anti-UAV technology. She says that both industries will continue to grow and innovate, but that they may move outside the U.S. if the regulatory environment does not improve. The Cipher Brief: Concerns about malicious use of UAVs have been rising for some time. How would you assess the threat posed by UAVs to the United States? Rachel Stohl: The issue in the U.S. – and I think it is not unique to the U.S. – is that the technology is spreading rapidly. It is technology that is accessible to a lot of people and across a large section of society, and has commercial uses as well, not just nefarious ones. When you have access to technology, and it becomes possible to weaponize it, the options for using it maliciously also expand. Again, I don’t think that’s unique to the United States. I think we are seeing the proliferation of the technology around the world for both military and non-military uses. TCB: The concerns about bad actors using UAVs have prompted the creation of systems meant to disable or destroy UAVS. What are the advantages of using this kind of systems? What are the potential downsides? Military manuals do not often attract readers from outside of the profession of arms, and the publication of the US Army/US Marine Corps’ manual on counter-insurgency (FM3/24) by theUniversity of Chicago Press ten years ago was one of those rare occasions where military doctrine gained an audience beyond the armed forces. FM3/24 attracted wider attention because of Iraq, and the protracted insurgency in which US and Coalition forces had become embroiled after the overthrow of Saddam Hussein’s regime (March-April 2003). The US armed forces (the Army in particular) had focused almost exclusively on inter-state warfare, and as a result they were collectively unprepared for the challenges of occupying and pacifying Iraq following Saddam’s fall. Abu Ghraib, Haditha, the two battles of Fallujah, mounting American military casualties, and an increasingly disastrous sectarian war between Shiites and Sunnis forced the Army and Marines to rethink their approach to counterinsurgency (COIN). The adoption of FM3/24 – and the ‘surge’ of troops into Iraq in 2007-2008 – appeared to herald a ‘COIN revolution’ in American military thinking, and indeed one of its authors (General David Petraeus) became a household name as a consequence. Britain also had a reality check over Iraq, and subsequently Afghanistan too. Before 2003 there was an academic and professional consensus that the British Army had an instinctive talent for COIN, based on their experiences fighting guerrillas and terrorists from Palestine in the 1940s to Northern Ireland (1969-1998). The experience of peace support operations (PSO) in the former Yugoslavia and Sierra Leone appeared to provide added justification for this myth, with squaddies being supposedly attuned to the complexities of ‘hearts and minds’; possessing the inherent ability to both cow potential adversaries while winning over the local populace with ‘soft posture’ patrolling and the ‘cultural understanding’ that came from phrase-book chit-chat. The increasingly violent occupation of Basra (2003-2007) and the ferocious fighting experienced in Helmand showed that in fact the British armed forces were no more masters of COIN than their superpower allies were. Military analysts commonly assert that, of the two basic types of warfare, maneuver and attrition, the former is a superior form of fighting and, therefore, is the natural choice of skilled armies. This claim ignores an important point, however. Even the most skilled armies sometimes choose an attrition-oriented battle doctrine rather than a maneuver-oriented one, because their states’ strategic environments warrant such decisions. The Israel Defense Forces (IDF), a consummate practitioner of maneuver warfare in the post-Second World War era, has steadily shifted toward an attrition-oriented battle doctrine over the past few decades as a result of Israel’s changing strategic environment. Maneuver and attrition constitute the two basic types of warfare. Maneuver warfare is based primarily on mobility. Armies that employ maneuver warfare are those that attempt to penetrate—through either frontal assaults or flanking movements—into their opponents’ hinterlands with the intent of bringing about their opponents’ rapid collapse by wreaking havoc in rear areas. Attrition warfare, to the contrary, is based primarily on firepower. Armies that employ attrition warfare are those that wage either very slow-moving or largely static slugging matches with their opponents with the intent of grinding down their opponents to the brink of annihilation. Maneuver and attrition warfare are often portrayed as polar opposites that are mutually exclusive, but such a stark contrast is quite misleading. All armies across both time and space have been guided by battle doctrines that combine both mobility and firepower. Neither pure maneuver nor pure attrition warfare has ever existed in the annals of military history. Nevertheless, it is certainly possible to classify battle doctrines as either maneuver-oriented or attrition-oriented, depending upon which end of the mobility‒firepower spectrum they lean toward. Those battle doctrines that emphasize mobility over firepower are maneuver-oriented, while those that emphasize firepower over mobility are attrition-oriented. So you say you want innovators and disruptive thinkers? Greetings! This week’s piece pivots off of the Commandant of the Marine Corps’ comments regarding disruptive thinkers, which intersects nicely with an article I am wrapping up on Evans Carlson and his Raider concept in WWII. It is also influenced by the broader context which seems to favour and privilege innovation. And so, as the tide seems to be in favour, I thought I would just disrupt things a little. Enjoy the piece and join the discussion on Twitter at the hashtag, #CCLKOW. In a call for support from the Corps’ hidden legions of disruptive thinkers, General Robert Neller initiated what amounted to a cultural revolution. Confronting what seems to be an increasingly complex world it is hoped that such individuals, as well as contenders from the rank and file whose experiences can light the path to real world solutions, will aid the agility and effectiveness of the Corps. This latest genuflection at the altar of the novel builds on the larger trend which values innovative thinking. We are all quite certain this is a good thing, right? First, Neller is correct to note that the culture of the Marine Corps must adapt if this has the slightest chance to offer anything more than fits and starts of short-lived new ideas. For its many strengths, there is an historical resistance to figures whose ideas lie too far outside the standard. Evans Carlson, father of a wildly innovative warfighting unit and concept, did not succeed within the institution. Nor did William Corson, the Marine officer behind the first and very novel Combined Action Program in Vietnam. The successful Marines of the last 75 years have been those who have moderated change at the fringes but not fundamentally altered course. These are the cultural terms of success that will need to be countered. Of course, the problem is that institutional culture is a very difficult thing to change, and it is debatable whether that can be achieved under the tenure of a single commandant. Second, this effort and others more generally assume that the best answers will come from within the armed forces and in direct response to issues. But important innovation is often found in odd spaces disconnected from the particular problem at hand. Much of the smart advances in air mobility between the two world wars came from the private sector or other public services. While I am not in favour of the thinking which posits that war and commerce as activities are similar, I am not so dogmatic that I cannot see the value of certain competencies crossing between the two areas. This is not to suggest that internal voices not be listened to or even heard, but only to caution that left and right of arc is limited if the box one need get outside of is only the military one. There are plenty of things I’ll miss when I eventually leave the Army: the camaraderie, the sense of duty, and the feeling of being part of something bigger than myself. But there is one thing—other than the reflective belt—that I won’t miss when that day comes, and that is mandatory training. It can be sheer agony to sit through one mandatory training class after another, be it the Cyber Awareness Challenge or the Choose-Your-Own-Adventure approach to countering human trafficking, no matter how hard the developers try to make it interesting. Leaders have long understood that there are far too many mandatory training requirements. In fact, the recent National Commission on the Future of the Army recommended Army leaders “reduce mandatory training prescribed in Army Regulation 350-1, Army Training and Leader Development.” And a 2011 study designed to aid Gen. Martin Dempsey’s transition to Army chief of staff featured findings from the field such as the suggestion to “take a red pen to,” or eliminate, most of the requirements in AR 350-1. Indeed, recommendations such as these date back to official studies commissioned even before 9/11. But while the problem is well-known, there’s often little Army leaders can do to hack away at the ever-growing problem of mandatory training requirements. How much is too much mandatory training? For over a decade, it’s been painfully obvious that it is impossible for Army units to accomplish all their mandatory annual training requirements in a calendar year. A 2002 study commissioned by the U.S. Army War College Strategic Studies Institute found that company commanders had a total of 256 days available for training annually, accounting for weekends, holidays and block leave. Yet given the deluge of mandatory training requirements in 2002—over 100 separate requirements—it would have taken 297 days, a deficit of 41 days, to accomplish all assigned training. Though civilian and military leadership have placed great emphasis on the need for the U.S. military to maintain technological and conventional forces overmatch against its potential adversaries, there is little mention of the need for unconventional and political warfare supremacy. Unconventional warfare[i] and political warfare[ii] offer valuable strategic options beyond traditional military means to achieve national policy objectives. They are especially useful in their suitability to target the human domain, where the psychological and moral dimensions of war reside. A war of insurrection is a battle for the national will, for popular support between the insurgents and the host nation government. Many enemies of the United States have already spent years expanding their influence across human terrain within their spheres of influence to shape the international stage in their favor. It is time for the United States to catch up. The different elements of power can provide one nation an advantage over others: economy, geography and resources, national will, military force, and political structure. [iii] For a national grand strategy to be successful, it must integrate all of them into a comprehensive approach that brings the force of the entire country’s capbilities to bear against the enemy. The United States seems bound by a tunnel vision regarding unconventional warfare that brings policy makers to believe it belongs solely in the hands of Special Operations Forces (SOF). [iv] This mistake wastes the incredible capacity of the rest of the U.S. government to bring about massive change and influence domestically[v] and internationally. There is also a prevalent climate of reactionary rather than proactive foreign policy, especially in the realm of unconventional warfare. In this sense, the U.S. position is more a reaction to the foreign policy of aggressor nations and non-state organizations rather than a definite and cohesive American foreign policy. This leaves the United States reacting to threats as they rise rather than proactively and pre-emptively engaging the international community, target nations, and local populations to shape social and geopolitical environments that are conducive to U.S. foreign policy objectives and that help prevent the development of threats. The United States must combine the full weight of its national power to achieve long-term strategic success with unconventional warfare efforts and countering those of its enemies. For a strategy to be complete, it must include both ends and means: the desired political objective and the method to achieve this strategic end. All of the national tools of power (means) fall subordinate to the policy objectives (ends) set forth by the President and, to a lesser degree, Congress. Therefore, the first step in strategic planning must be that decision makers issue clear guidance on the foreign policy goals that the military and diplomatic strategies have to support. The next step requires development of infrastructure to support joint, interagency, intergovernmental, and multinational (JIIM) efforts to support whole-of-government planning and execution of an unconventional warfare strategy. In this paper, I define critical restructuring needs of the U.S. government and propose strategic lines of effort to facilitate a comprehensive national approach to the conduct of unconventional warfare and countering its use against the United States. Scores of dead civilians, smoldering wastelands where villages used to be, a cowering people, and a regime thriving on tyranny and fear — these are the images evoked by the mention of “authoritarian counterinsurgency.” Most recently, in Syria, Bashar al-Assad’s brutal and uncompromising campaign against his own people provides an unnerving illustration of its execution. Russia’s bloody entry into this war, on the side of Assad, has only sharpened the juxtaposition of authoritarian counterinsurgency and the approach attempted, however ineffectively, by Western, democratic states. Whereas democracies strive to win hearts and minds, authoritarian states “waste them in the shithouse,” as Vladimir Putin put it in 1999. Whereas democracies are constrained by law, authoritarian states act with impunity. And whereas democracies contend with a critical media and electorate, authoritarian regimes own both and control the narrative. Regime-based comparisons such as these often betray frustration with recent Western counterinsurgency campaigns. Be it the Russians in Chechnya or the Chinese in Xinjiang, we face the uncomfortable possibility that authoritarian counterinsurgency is simply more effective. In some circles, such suspicions lead perversely to envy, based on the tantalizing promise of a better, if inconveniently repressive approach. After all, what adversary could withstand the full force of the American war machine, were it let loose? Legitimacy, reform, hearts and minds — this is also where Western counterinsurgency has faltered, so what better solution than to push these concerns aside? Not only is this a perverse conclusion, but it is based on a troubled and confused comparison. Rather than be divided into democratic and authoritarian absolutes, most regimes fall somewhere in the middle. Between 2004 and 2014, “about 70% of authoritarian states held legislative elections and 80% held elections for the chief executive,” giving rise to the term “democratic authoritarianism” or “anocracy.” Better coding might help, but presumably, if regime type truly matters, analysis must anyway go further and consider different types of authoritarianism: bureaucratic, monarchical, military, and one-party systems. Such nuance is rarely found, even within the attendant literature.